Imagine all your follow-up emails and reminders now taken care of automatically by Docsvault! You don’t need to chase customers for payment or follow up your team for a project. Docsvault can send out personalized emails to your customers or vendors based on certain rules, so you don’t have to spend your valuable time sending individual emails to customers and team members. Docsvault Enterprise Edition brings a powerful communication tool at customer’s fingertips – Auto Emailing. Auto Emailing jobs work in the background and can be used to send out emails when a specified email rule is satisfied. This is a great feature to send out reminder emails for expiring policies, contracts, payment reminders, task follow-up or for any other purpose that is time sensitive. 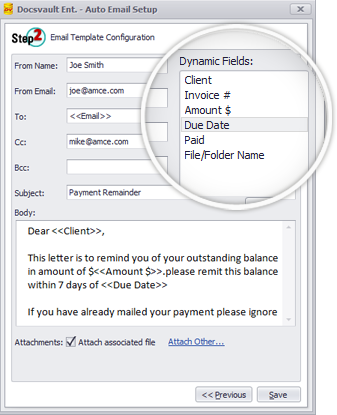 Send out personalized reminders to your clients using variables, without the burden of having to manually enter fields like names, contract or policy numbers, amounts, due dates, etc. This valuable communication feature can radically reduce the time spent on mundane and unproductive activities like sending follow up and reminder emails. You can narrow or widen the scope of email sender job as desired. Simply select the scope documents, specify date and index rules, anddefine a schedule for the job to run. Customize the emails to personalize them and Docsvault will take care of the rest. Auto Emailing offers traditional email functions plus the ability to send out emails on schedule, attach relevant documents dynamically and personalize emails with specific names, dates, etc. Sends out regular emails to customer for renewal, upgrades etc. thus leaving nothing to chance.